Every year that I own a garden railroad, something that was important to me earlier falls by the wayside and something I hardly noticed before becomes important. As an example, having after-dark open houses two years in a row (and running trains after dark for parties besides) showed me that the only trains people notice after dark are passenger trains with lit cars - something that was not all that important a few years ago. And now, with the cars lit in a dark environment, it becomes painfully obvious that there are no passengers in the passenger cars. In daylight operations, you'd probably never notice. So if you usually run your trains in daylight and you think this is a silly issue, you're probably right. But I did get to thinking about how I would put figures in my passenger cars without spending more for the figures than I did for the cars. Several months ago, looking for affordable figures, I tried ordering (through Ebay) from a number of Chinese vendors. 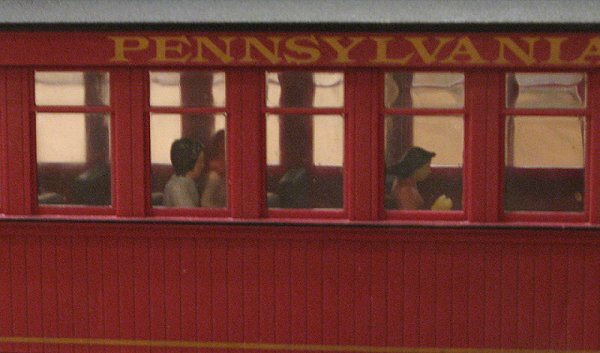 You'll see them if you go to the Toys & Hobbies/Model RR Trains/G Scale page, then start searching for "figures." 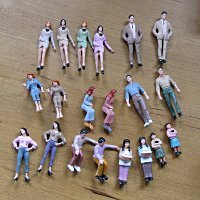 I published my experiences in an article called More about Scrounging Figures. I have used several of those figures on my RR during an open house, and they are fine for station platforms, sidewalks, etc., especially ones that are too far away to see $6 figures clearly anyway. 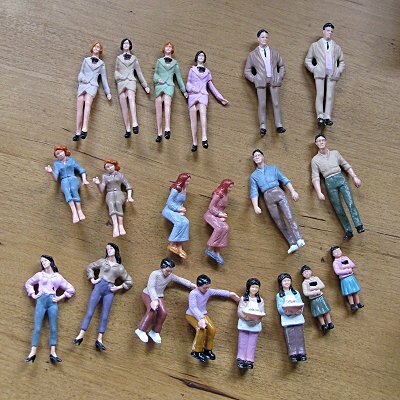 If you shop on Ebay for these, you'll see that most of the vendors have a very similar set of molds, or are all actually buying from the same factory. 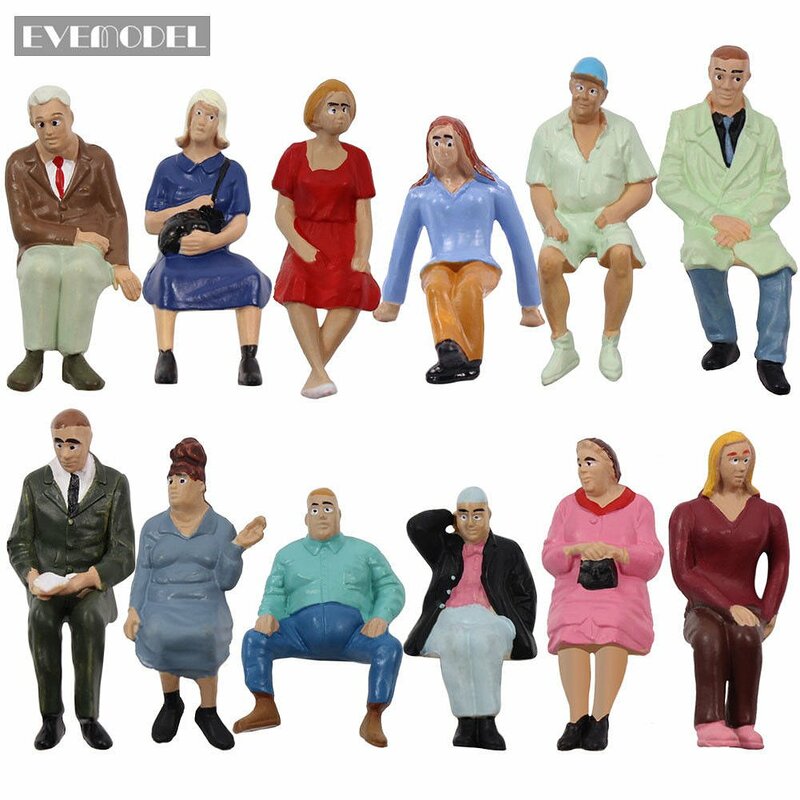 There are three or four figures that they all seem to sell, but each seems to sell one or two that nobody else does. Plus one of my more useful vendors just shut down for December, so your mileage will vary. I have links to a few vendors in this article, but the links will vary depending on what they have posted on Ebay in any given week. 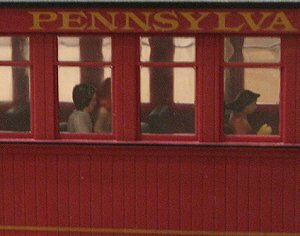 Note About Smaller Scales - Although this article addresses Large Scale trains and passengers, the news is even better for folks who model in smaller scales - the same vendors I've listed below sell O scale and smaller figures for much less than the cost of Large Scale figures. For On30 users, the news is even better - the tops come off the coaches easily by squeezing the roof and gently rocking it back and forth to break the (minimal) glue seal. There are little plastic "bumps" that hold the roof in place. Squeezing the roof should enable the edge they catch on to come free, at least on one side. Just don't accidentally catch the clear plastic thingie in the middle of the car - that's for illumination. 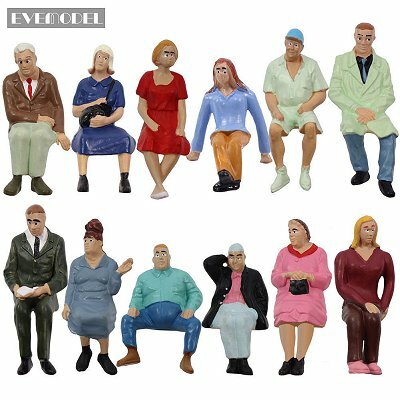 This summer, I ordered some more, including seated figures that are advertised as 1:24 and 1:32. (Some vendors advertise them as 1:25 and 1:30; don't worry, they're the same molds.) But I never got around to trying them in my passenger cars, until yet another mail-order "new old stock" Aristo Sierra coach arrived with several of its windows loose. The first time I bought a "like new" Aristo Sierra coach over the internet and it arrived with several windows out, I blamed false advertising. But by now, I realized that the glue on these things just eventually dries out to the place where jarring the model at all (even if it's well-packed) shakes them loose. Okay, now I had to open the thing, so I might as well try some of my new "benchwarmers" in it. Fortunately, it's easy to get the roofs off of Aristo Sierra coaches. There are two screws at each end just under the overhang. Once I got the top open, I also realized that one of the benches had shaken loose as well. So I used superglue to glue the windows and bench back in place and waited a while. I should have used Duco or something like that on the bench, but I had misplaced my tube of that and didn't want to wait. Once I had the car glued back together, I experimented with my 1:24 and 1:32 figures. If you don't check out any of the other "blowups" on this page, click on the photo at the right to see a larger version - it will be quite informative. The 1:32 Chinese figures fit nicely, although a couple were balanced in such a way that they don't sit up straight unless they're glued down. In the photo to the right, the workman in the lower right and the couple near the top are 1:29. The other couple shown is 1:24. I was a bit surprised that they would fit on the Aristo benches as well as they did, because I've had other brands that didn't. That said, when I've sat in similar coaches, the lower edge of the window usually hit me about shoulder height, and the top pane is usually above my head. The male 1:32 figures seemed to fit into that "window" better than the 1:24 figures. In fact, when I looked in the side window, the 1:24 man's head actually disappeared behind the curtain valence, something that would happen to Larry Byrd, but to few others in this generation, much less the early 1900s. All told, the 1:24 couple looked like they were riding in a "kids train" or amusement park train or something - not the look you want in your railroad. 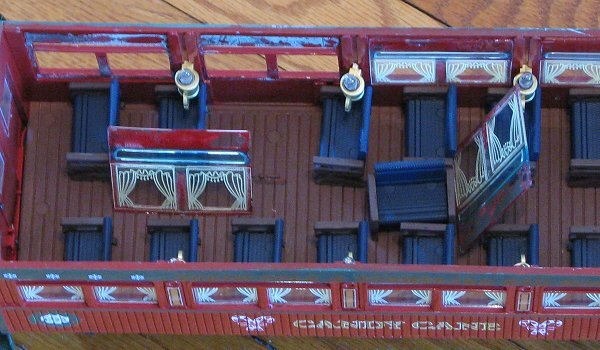 Okay, this was one of my Christmas coaches, and I have several "year-round" coaches that could stand passengers, too. So I took out the "giants," glued down four figures, waited for the glue to dry, closed the lid, and saved the rest of my 1:32 figures for other cars. But what about the 1:24 "giants"? 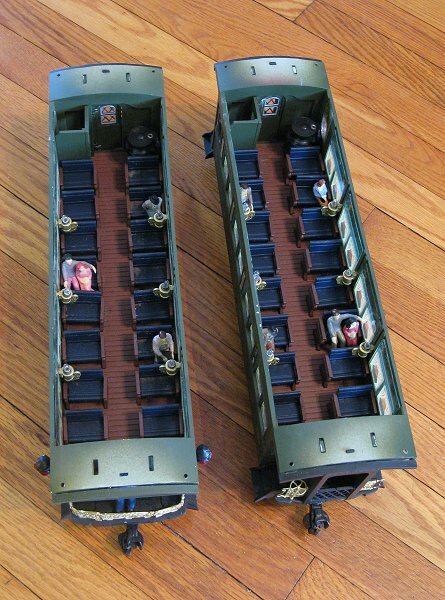 I have a few Bachmann coaches that could stand some passengers, too. So I got one of those out. Once I started to open it, I realized that it was the kind without lighting pickups, (just a battery holder I never use). So it's not going to get figures until I have the the other units done, or else a really cheap source of sitting figures. But for the sake of trying out the fit of my 1:24 figures, I opened it up anyway. 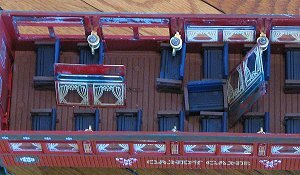 The Bachmann coach comes apart from the bottom. There are four screws evenly spaced along each side, plus two little "snap-on" tabs on each end. When you open it up, the floor, stove and restroom walls come loose at the same time, so pay attention to how they fit together. 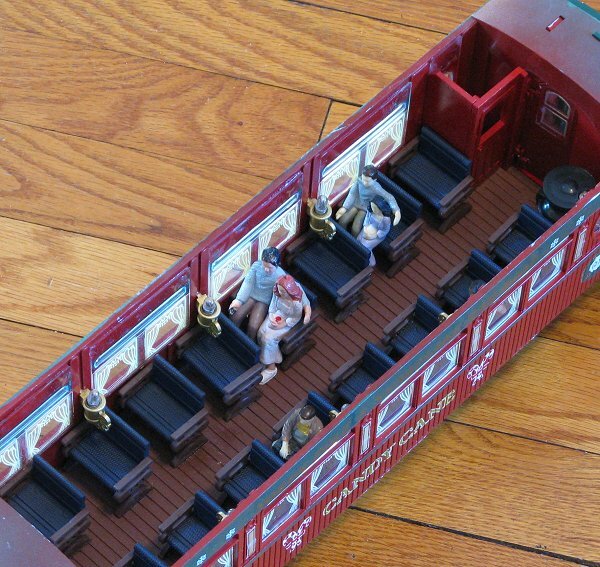 Also, the battery-powered coaches have little metal tabs that are supposed to stick up into the walls and make contact with other metal tabs, so pay attention to that when you put the car back together. 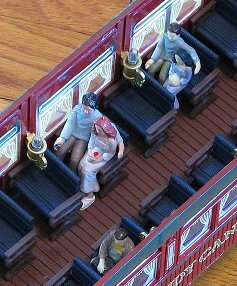 As you can see, with the coach reassembled, the figures appear about where they "should" in the car windows. 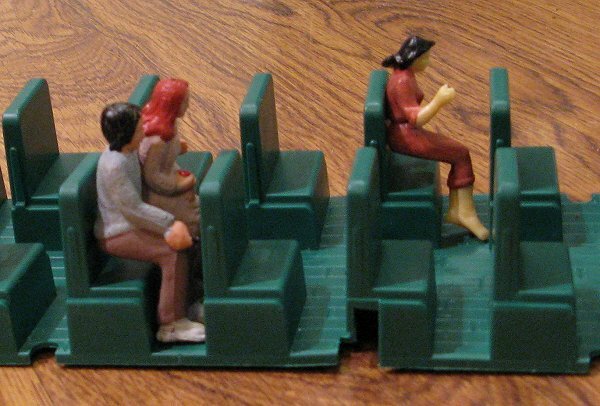 Cutting off their feet so their bottoms sit on the low "seats" would make them sit fairly low. 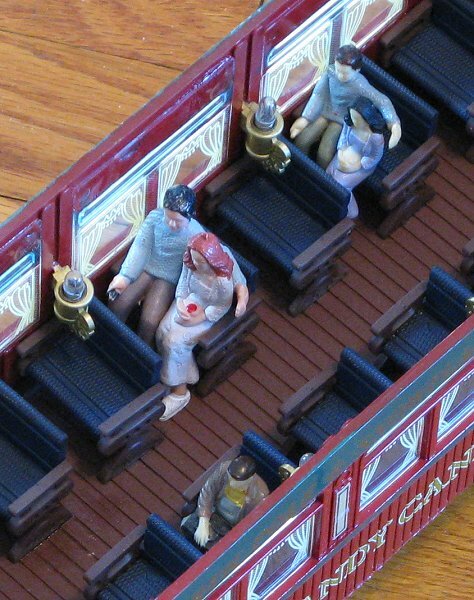 If I was doing this just for me, I'd consider just gluing the figures' backs and feet in place - the chances of anyone looking through the windows being able to tell that the figures' bottoms weren't touching the bench would be pretty remote. On the other hand, the Bachmann cars are a bit of a pain to get apart, so you want to make certain that, once the figures are installed, they stay installed. With the Bachmann floor/seating piece being a bit flexible, that rules out glues that have no give, like Superglue. Maybe a glob of silicone under their feet, a big glob under their bottoms, and a dab behind their backs would do it. 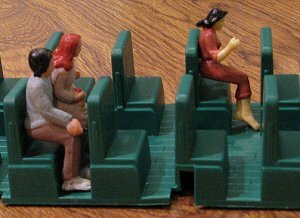 I'll let you know when I've installed a few of these figures permanently in Bachmann coaches. How Many Figures Do You Need Per Car? Less than six looks fairly empty, but twelve per car would probably be plenty. I have been averaging 4-7 because I have a lot of cars to fill, and my most helpful vendor has run out of stock, at least for now. Twenty would be overkill, unless you're deliberately modeling a circumstance in which the train was at capacity. One thing to consider is that, with the different paint jobs, you can repeat figures per car, but you probably wouldn't want to repeat a figure on the same side of a single coach. I've known people who made all their own figures from Sculpey or something and didn't mind making up a batch of "low-rez" figures to fill up a coach or three. But not all of us have that skill - plus the Sculpey figures would add a lot more weight than these characters. 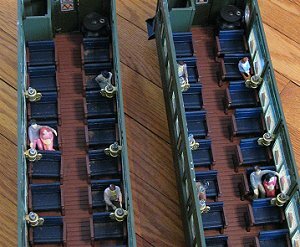 In addition, you may have broken or low-quality figures that you don't want to use on your railroad that will do fine in a car. Don't let the fact that they're standing up instead of sitting down dissuade you. In the words of Grishnakh, in The Two Towers, "What about their legs? They don't need those!" The truth is that in most Large Scale coaches, no one will be able to tell that your figures are truncated unless you take the top of the coach and show them. 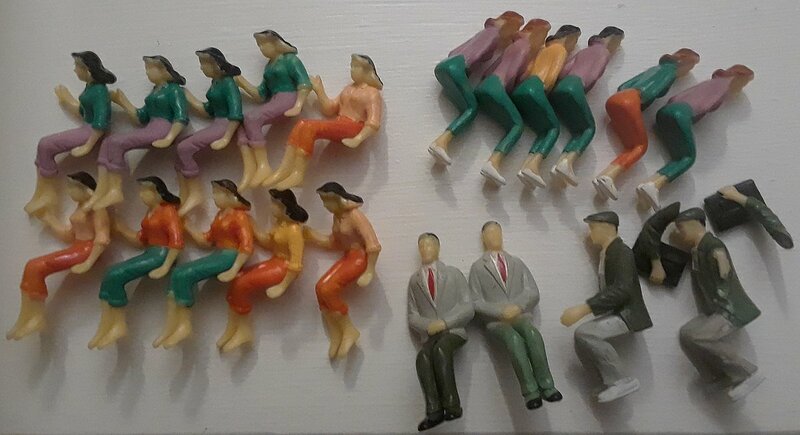 Some of the vendors off and on will sell large batches of standing figures for an inexpensive price (say 100 for $35). If the batch only has four or five figures, and two of them are obvious like the girl with the cookie tray in Everydaygoodz's assortment above, there's not much point in an individual buying such a batch. But if there are several different figures, and they're cheap enough, you might consider buying such a batch and sawing them all in half for your passenger cars. (At .35 - .50 apiece, you can't go too far wrong. As an example, in my first order of Chinese figures, I received not two, but four of a figure I don't think is worth displaying. I think it's supposed to represent a "leggy" young woman with a very short skirt. There isn't one setting on my railroad where this figure would be appropriate. (I made certain that the next time I ordered from Everydaygoodz, who usually offers great customer service that he didn't send me any more.) But she would look just fine sitting in a coach. And no one would ever notice her missing extremities. (maybe I could save them up to use as "awards" for Christmas Story fans). I've ordered figures for different purposes from three different Chinese vendors. Because I shopped carefully and occasionally bought in bulk, I averaged around .50 a figure. Unfortunately the store that was most helpful last fall (Cnmodelnt) is out of stock today, and some of the other vendors are low on stock, so if you want the best deals, you'll have to shop carefully, offer to buy "wholesale," or wait until January and see if the the vendors are getting new stock in. Don't worry about the mangled English on some of their storefronts; they want your business and are pretty good about sorting out issues. Also, most of them are open to making a "deal" on large quantities. Here are a few links to their Ebay stores. Again, their stock varies from month to month, so you may need to poke around. The last one on this list has been very helpful, but he sold completely out of stock in early December, so I don't know when or if he'll have more to sell. 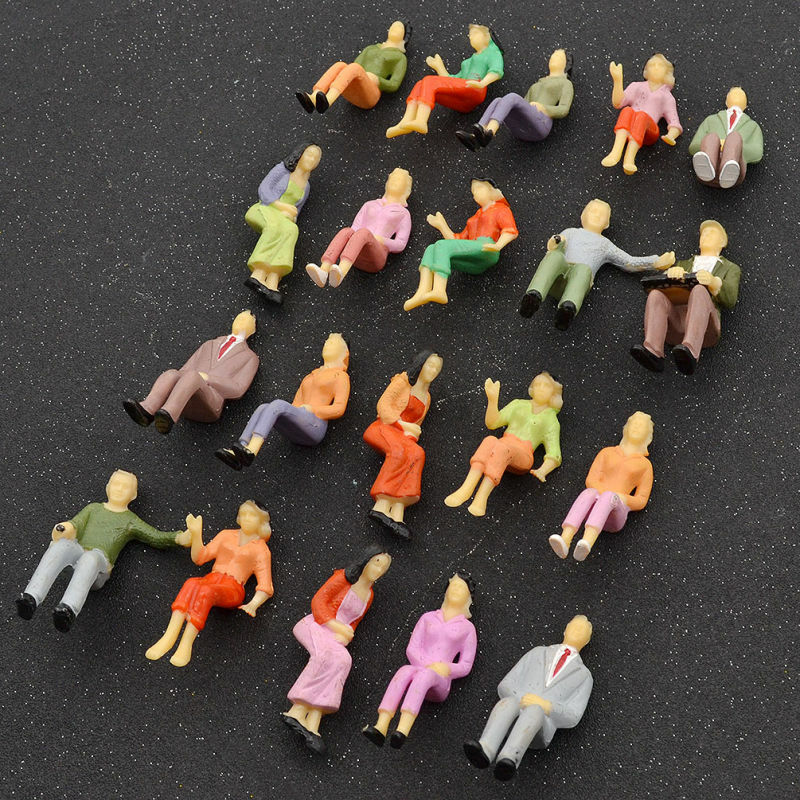 In addition, MOST of these vendors will sell wholesale lots if you contact them, so if you want to pick up 100 or 500 figures for yourself or your club, you might could bring the price way down. This is just one set of suggestions, affecting two common garden train coaches, but it's a place to start. And it does make your "passenger service" at least a little more believable for only a few dollars. The photo at the right was a last-minute addition, the result of getting two more WP&Y cars with half of the windows jarred loose. I put each figure or pair of figures "behind" the little light so it should be easier to see their little faces when the lights are on in the cars. We'll see. I didn't put in many figures, because my best supplier is temporarily offline, so I wanted to save figures for the PRR cars I run most often. At any rate, even a few "paying customers" are alredy improving the look of this railroad. Please let us know if you've found another solution to share with our readers. I'm writing this after a move and several adjustments related to the new way I am building and operating my new railroad (under construction). For one thing, our biggest "open railroad" of the year is always Christmas-themed November event, which - weather permitting - often involves running trains after dark. But you can't really see freight trains running after dark, so I usually use illuminated passenger trains. And that's when it becomes obvious that there aren't any passengers in the train. 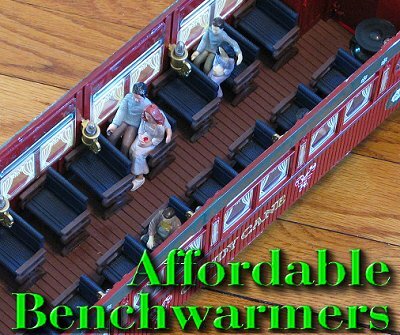 I have several Bachmann coaches that need minor repair, so I decided to order some more benchwarmers and glue them in place while I had the cars on the workbench. As mentioned above, the vendors almost all use the same molds, so I ordered from one that offered the best price - "us-enjoy." The photo from their eBay ad is shown at the right. You never know what assortment you'll really get. You do know they will be poorly painted - but you can't tell once they're glued into place behind the windows. Most of the figures could be duplicated at least once per car and no one would ever notice if you used ones with different clothing colors. The woman with her arm out is the exception - she's too obvious to reuse much unless you cut her arm off. But up to now, each set of these I've ordered has had only a fair proportion of these. With six molds, that's two out of 12, for example. I ordered two sets. The photo below shows what I actually received after several weeks (they really were, apparently, "on a slow boat from China"). This is ALL I received, 20 pieces, when there should have been 40. Beyond that, having only 4 of the six molds, having two broken figures (one missing an arm altogether, so I know it was broken before it was sealed in the package) and having HALF of the collection being the woman with her arm out was a little ridiculous. These people aren't afraid of a bad review on eBay because when I contacted them with many more details than I have listed here, they pretended not to understand why I was dissatisfied and asked me for MORE information and a photograph. I could easily have "returned" the package, which they won't want me to do, because the cost of shipping it back to China will be more than the figures are worth to them. Most vendors in this situation will simply say, "Here's your money back; keep it." But I wanted to give them a chance, so I have sent them this photo. Since I sent the photo they have not replied at all. So I have requested a return. Since I paid with PayPal, I know I can get my money back even if they don't "approve" the return. I'm not exactly worried, just a little surprised because most of the vendors who sell these things have been very scrupulous. Gee, I sound like that old lady who used to yell at us for making two much noise when we rode our bicycles past her house. If you are going to order any of these sets from any of the vendors who sell them, please be sure to order months ahead of when you think you'll need them, in case it takes them that long to get to you or in case they botch the order. I also ordered two sets that were much more fun. 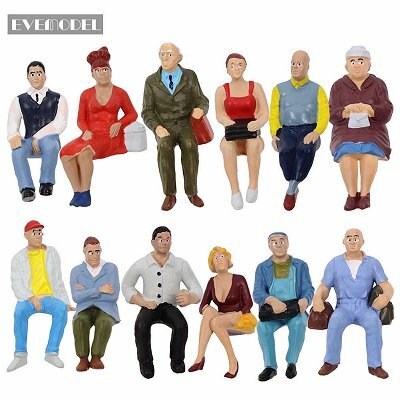 These are also Chinese, as far as I can tell, but they have a lot more personality and detail than the generic figures in the set above. Apparently, the modelers decided not to "save money" by only making models of skinny people. Each set cost me ~$16 and included figures that will look great on station platforms, etc. I got these from two different vendors, but one of my old favorite vendors cdmodelnt seems to have both in stock at the moment, and shipping tends to be much faster than some of the other folks. Note: Family Garden Trains?, Garden Train Store?, Big Christmas Trains?, BIG Indoor Trains?, and BIG Train Store? are trademarks of Breakthrough Communications (www.btcomm.com). All information, data, text, and illustrations on this web site are Copyright (c) 1999, 2000, 2001, 2002, 2003, 2004, 2005, 2006, 2007, 2008, 2009, 2010, 2011, 2012, 2013, 2014, 2015, 2016, 2017, 2018, 2019 by Paul D. Race. Reuse or republication without prior written permission is specifically forbidden.